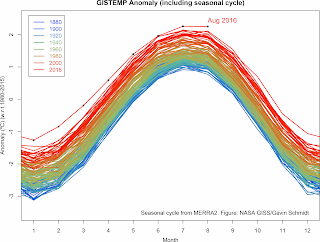 August 2016 was the warmest August in 136 years of modern record-keeping, according to a NASA news release and as illustrated by the image on the right. The seasonal cycle makes that temperature typically peaks in July. Nonetheless, August 2016 wound up tied with July 2016 for the warmest month ever recorded. So, when incorporating the seasonal cycle, it was more than 2°C or 3.6°F warmer in July and August 2016 than it used to be. It's important to compare the temperature rise with preindustrial levels, given that end last year at the Paris Agreement countries pledged to keep temperatures from rising by more than 1.5°C above preindustrial levels. NASA typically calculates anomalies by comparing temperatures with the period from 1951 to 1980, so without adjustment and without including seasonal cycle, the picture looks like the one below. The added polynomial trendline shows that the anomaly grows, when comparing the temperature rise with an period that goes back further. On the image below, a 0.28°C adjustment is applied to the data, to bring the baseline back to the year 1900. Going back further than 1900 will result in even higher anomalies, as illustrated by the image below that applies a 0.58°C adjustment to cater for the rise before 1951-1980, as discussed in an earlier post, resulting in an August 2016 anomaly of 1.56°C. 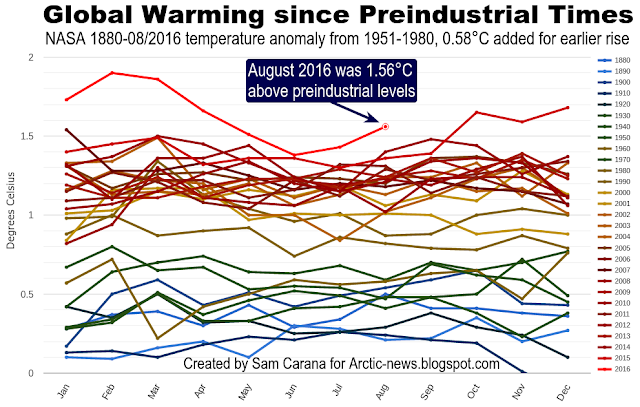 As above image also shows, temperatures have been more than 1.5°C above preindustrial levels for most of the past 12 months. Thank you so much for all of your dedication as well as everyone else with the AMEG. Just curious if you've come in contact with anyone who's sent this to the Clinton campaign? I feel that is our only hope in the US and would like to either connect with that person/group or reachout to the campaign myself if no one has done so. Thanks, I'd love to get in touch with more people who are in a position to change things. People can always reach me at facebook.com/SamCarana.